The annual Leonid Meteor Shower peaks tonight / Wednesday morning, and sky-watchers could be treated to 10 to 15 meteors per hour, weather permitting. An Internet web-cast of this meteor shower will be available tonight, if clouds preclude direct viewing of the event. A link to this Internet web-cast is at the end of this blog post. The peak of the Leonid Meteor Shower actually occurs on Wednesday Morning, 2015 November 18 at 12:00 Midnight Eastern Standard Time (EST) / 5:00 Coordinated Universal Time (UTC). As with most meteor showers, the best time to view the shower is between local midnight and dawn, when the Earth is rotating into the shower. A meteor shower normally consists of dust particles related to a comet. Each time a comet approaches the Sun, the comet loses dust particles following the melting or sublimating of ice on the comet. These dust particles, called meteoroids, continue to follow the same celestial path as the comet and form a meteoroid stream. Each year, as the Earth orbits the Sun, the Earth passes through several of these meteoroid streams, becoming Earth's meteor showers. While passing through one of these meteoroid streams, Earth's gravity attracts many of these meteoroids and they fall to Earth; then, they are viewed by people as meteors as they burn-up in the atmosphere. Most are extremely small and burn-up completely. 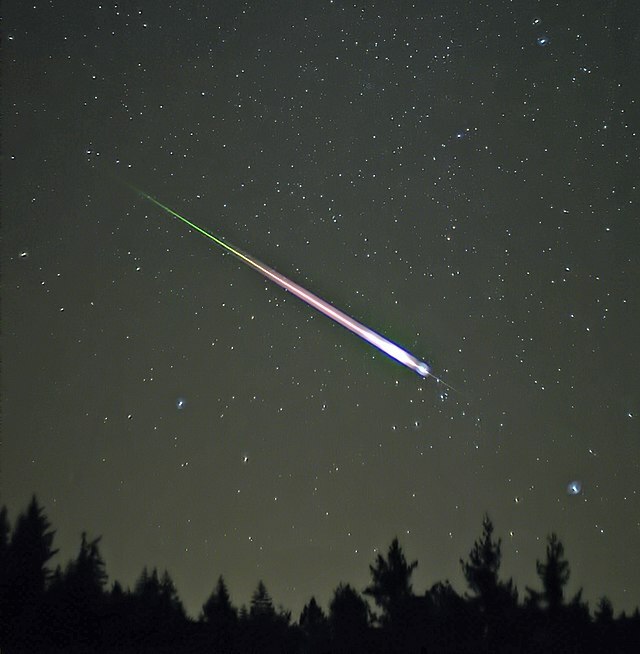 From time-to-time, larger particles enter the atmosphere and create brilliant displays known as fireballs or bolides. If these particles are large enough, they may not completely burn-up and land on Earth as a meteorite. Meteors from the Leonid Meteor Shower emanate from remnants of Comet Tempel-Tuttle. Not named after the parent comet, the Leonids are so named because most meteors appear to radiate from the Constellation Leo the Lion, known as the meteor shower radiant point. However, you should not, necessarily, be looking only at Leo, when looking for meteors in this shower. Meteors can appear in any part of the sky at any time (although a meteor's trail may tend to point back toward the radiant). The Leonid Meteor Shower in 1833, which was actually a huge Meteor Storm (when tens-of-thousands of meteors were seen in just a few hours of time), started serious scientific investigation of meteor showers. Yale University Professor Denison Olmsted, after observing the Meteor Storm in November of 1833, studied the meteor shower phenomena and was able to determine the actual origin of the meteors (previously, it had been thought that meteor showers were atmospheric phenomena). Two years later he and a colleague, Elias Loomis, were the first two American astronomers to observe Halley's Comet. Leonid Meteor Storms occur once every 33 years (most recently, they have occurred in 1966 and 1999), when many meteors are visible. Other years, such as this year, the peak rate of meteors would be about 10 (to possibly 15) meteors per hour, under ideal conditions. To more easily see the Leonid Meteor Shower, it is better to be away from city lights, as artificial lighting can drown-out the dimmer meteors. Binoculars and telescopes are not very useful for finding meteors. Meteors streak across the sky in a very short period of time, far too short to aim binoculars or a telescope. So, the best way to view a meteor shower is to lie on a blanket or beach towel on the ground, or use a reclining chair, in an area with a good view of the entire sky (with few obstructions such as buildings, trees, or hills), and keep scanning the entire sky. Bright moonlight can also drown-out some of the dimmer meteors, so monitor the Moon Phase on the monthly SpaceWatchtower Astronomical Calendar. However, bright moonlight should not be too much of a problem this year. The Moon is currently a waxing crescent and reaches the First Quarter Phase early Thursday Morning, 2015 November 19 at 1:27 a.m. EST / 6:27 UTC. So, only about half of the lunar disk is lit early in the evening, and the Moon sets before, or just a little after, local midnight over the next few days. Again, the best time to view a meteor shower is between local midnight and dawn, when the Earth is rotating into the meteor shower. So, if you go out to see the Leonid Meteor Shower, start looking for meteors around local midnight, or perhaps a little later. Make sure you have a good site where you can see most of the sky, and that sky is relatively clear. Be sure to dress properly for the Autumn, early morning temperatures. And, you want to go out ahead of time, before you actually start looking for meteors, to get your eyes accustomed to the dark sky. Dark-adapting your eyes for meteor-watching could take up to a half-hour. Of course, viewing meteor showers, like all celestial observations, are weather-permitting. If there are more than a very few clouds in the sky, meteors will be much more difficult to find. If the weather in your area does not permit direct viewing outdoors of this meteor shower, it can be viewed during a special web-cast on the Internet.